A Southern Grace: all aboard! I may have missed the cupcake train, but never fear--I hopped aboard a jigger and finally caught up. My cupcake guru, so it would seem, is Martha Stewart. Specifically, I've been very much inspired by one of her books and find myself wanting to make the majority of the recipes. I've done her snickerdoodle cupcakes, coconut cupcakes, and hummingbird cupcakes, and have had no beef (in both senses of the word) with any of them. Here are two more creations from my Cupcake Bible, one of which was far more successful than the other. 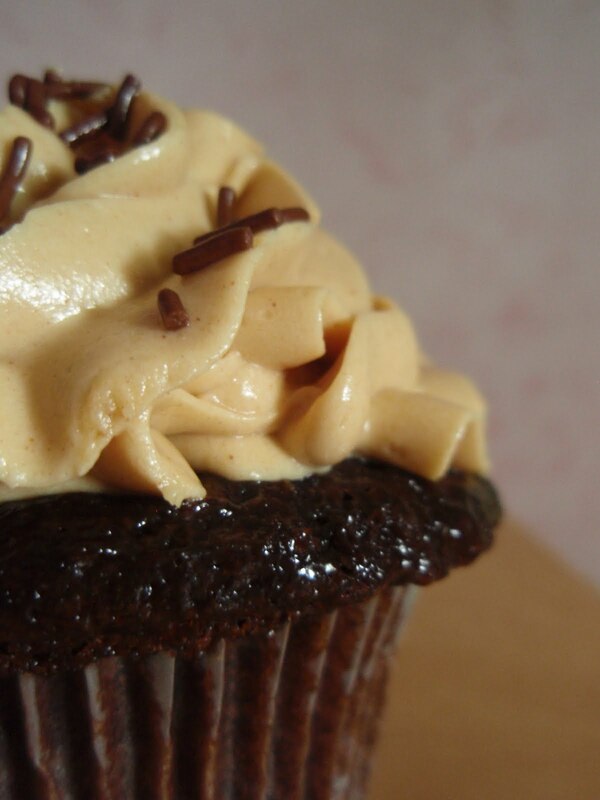 The first is a take on the good ol' peanut butter cup--chocolate cupcake and peanut butter frosting. Simple, but oh-so-satisfying. The second batch was blueberries and cream, which seemed to give me lots of problems, not the least of which was that all the blueberries sunk to the bottom. The batter seemed stiff enough to hold them up, but it just didn't happen. As my standards with Martha's cupcake recipes go, this one was a disappointment. I hope you don't mind that I was late to the party--those jiggers are hard to maneuver! Preheat oven to 350 degrees. Line 12-cup standard muffin tin with paper liners. Into a medium bowl, sift together cocoa, flour, baking powder, and salt; set aside. In a mixing bowl, cream butter and sugar until light and fluffy. Add eggs, one at a time, beating well after each, then beat in vanilla. With mixer on low speed, add flour mixture in two batches, alternating with sour cream and beginning and ending with flour. Cool in pan 5 minutes; transfer to a wire rack to cool completely. To make the frosting, beat cream cheese and confectioners' sugar with a mixer on medium speed. Add salt, then peanut butter, then vanilla. Whisk cream until soft peaks form, and then fold into peanut butter mixture. Use immediately, or cover and refrigerate for up to 2 days. Whisk together both flours, baking powder, and salt. With an electric mixer on medium-high speed, cream butter and sugar until pale and fluffy. Add eggs, one at a time, beating until each is incorporated, scraping down sides of bowl as needed. Beat in vanilla. Reduce speed to low. Add flour mixture in three batches, alternating with two additions of milk, and beating until combined after each. Fold in blueberries by hand. Transfer tins to wire racks to cool completely before removing cupcakes. Cupcakes can be stored up to 3 days at room temperature in airtight containers. I always drool over here! Both look AMAZING. I could just dive into a bowl of the peanut butter frosting. I totally missed the whole baking train! But I think I'm going to have hurl myself aboard for those first cupcakes! I'm drooling all over my keyboard... Those cupcakes look amazing. Martha's cupcake cookbook is one of my favorites as well! Better late than never...especially if you come bearing cupcakes. these look fabulous! These both look great. At first I thought that your blueberry cupcake was just a layered cupcake - they still look and sound wonderful. I have made a few of Martha's cupcakes as well and have had pretty good success. I need to try the snickerdoodles. I could never refuse either Grace. I don't care if the berries sunk to the bottom Grace, the colour is SO pretty. And it looks like a cool different layer anyway. But my heart is definitely over there with the peanut butter-chocolate cupcake. Droolworthy. When I need a cupcake fix, I come here. You just have a way of photographing them that I just love. You've also inspired me to get the 'bible'. You make me want to drive head first off of my health food drive. Darn you! And I mean that in a good way. Holy cow, sign me up! Peanut butter and chocolate is a match made in heaven. Yum for the peanut butter and chocolate. I love the two together. Next time mix a little of the flour with the blueberries. It might keep them from sinking. They still looked delicious, though! martha is my go to gal too for so many recipes. they are all winners! yours look fabulous. Darn blueberries! Why do they always have to sink?? Either way, both cupcakes look amazing. I'm not opposed to blueberries, EVER, even if they are sinkers. Always love stopping by because no matter what you make it looks and sounds amazing! Proven once again, Peanut butter and chocolate... two things this girl can't live without!!!! The peanut butter cup ones look amazing! I love cupcakes because it's like a mini cake for everyone! Plus you can be all cutesy and stuff. But I'm not going to lie, there is something deeply rewarding about icing a two-layered cake! I agree with The Teacher Cooks, I've always heard if you toss something in flour, it helps keep it from sinking-berries, nuts, chocolate chips. And either way, they look awesome, just call them blueberry bottom cupcakes. If a couple of each could get in my belly just now, that would be lovely! Oh my that shot of the peanut butter cupcake is killing me. My Ma told me that if you toss the blueberries with a bit of the dry ingredients then toss them in, they won't sink. She has yet to steer me wrong- yet! Those are both very pretty. I am particularly partial to the choco peanut butter ones-can never resist that combo! Grace, can I try both? They look so tempting, wouldn't know which one to start with. Love the pictures! I missed the boat all together but my oh my, your cupcakes are calling All Aboard! Funny thing about these two favorites of mine. I don't like peanut butter or blueberries unless they are bogged down in deliciousness. I'm in heaven but my coffee is needing a side-kick! Both cupcakes look amazing!Love your pictures and I would love to try the first one! The blueberries and cream sounds delicious wherever those berries end up in the cake! And, those peanut butter cupcakes are fabulousness in a small cake. The blueberry cupcake looks wonderful, Grace. No matter where the blueberries end up. I had no idea that was called a jigger! Two very nice cupcake recipes, that Martha sure knows what she is doing. Thanks for sharing. I don't think you missed the cupcake train. I think you lead it. I'll have to check that book out, the cupcakes look deeee-licious! Oh my gosh that looks so freaking yummy! I have missed you girl and your gorgeous recipes! I hate when blueberries sink. They still look delicious though and those chocolate ones look incredible! Glad you got on the cupcake train! Fried Green tomatoes was on last night and I thought of you! As a recovering Reese's Peanut Butter Cup addict, I will have to say the Peanut Butter Cup Cupcakes look dangerously delicious! 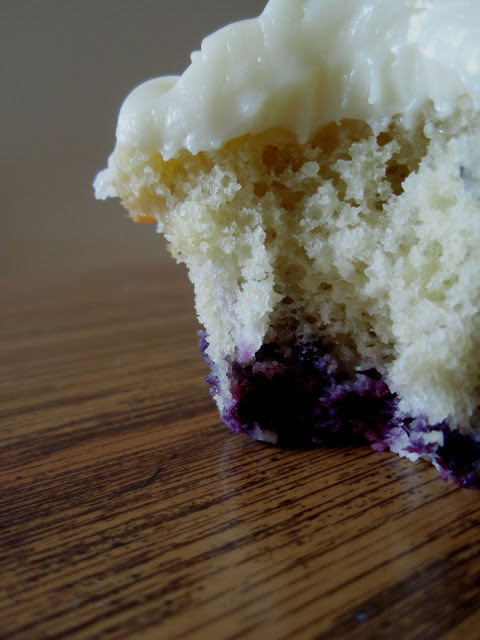 I was thinking the blueberries looked really pretty on the bottom of the cupcake. The peanut butter one would be a huge hit with my kids. Too bad the blueberry cupcakes didn't live up to your expectations, but those pb cup cupcakes more than make up for it, in my humble opinion! I know it wasn't the plan, but the blueberry cupcake actually looks cool -- like a blueberry version of a black bottom cupcake. I always love your cupcake creations..esp. the beautifully piped swirls..just marvelous. I too am a fan of Martha's baking. Her cakes always turn out well. Your cakes also look great! Even though the berries fell, the bright blue at the bottom is still eye-catching. And both of them look so moist and wonderful.